Grease plays a crucial part in the lubrication of railway axleboxes and bearings. SKF has evaluated its test procedures for measuring grease performance. 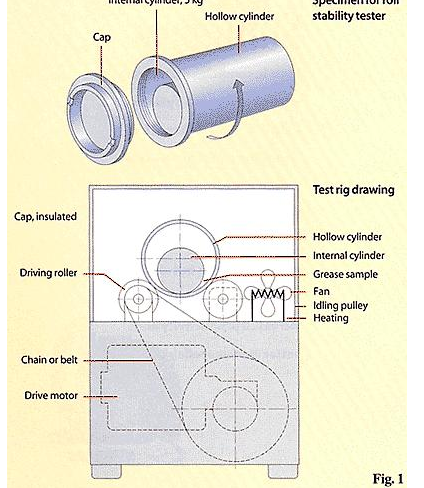 proper test to use in this application.Grease will only fight friction and conduct its lubrication function as long as it can be maintained in intimate contact with the bearing. 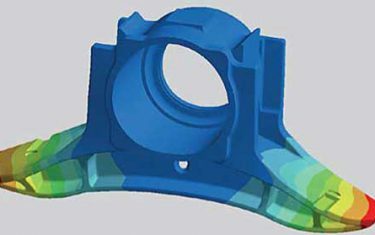 In railway applications, the axlebox and its bearings are constantly subjected to forces that attempt to remove grease from this contact. One force is the shock applied to the wheel as it runs over the track joints. This force produces the characteristic sound associated with railways. It can destroy the grease, reducing it to a liquid. How stiff is grease? This is a very complicated question as grease behaves something like tomato ketchup or non-drip paint. Generally, grease “thickness” is called consistency. Consistency of grease is measured using a cone penetrometer after it has been sheared in a “grease worker”. This is like working the grease back and forth through a potato masher. It applies a standard amount of shear to the grease and is akin to shaking the ketchup bottle for a set time. The penetrometer cone is then dropped into the grease and the distance it penetrates is measured. This measurement is made in tenths of a mm at a fixed temperature (10 units= 1 mm). Imagine dropping an object into thick mud at the side of a river. Compare this to dropping the same object into the water. In one medium it will penetrate the surface a little; in the other, it will sink. For grease, we can measure this value before and after the test. The penetration change can then be determined and shows the thinning effects of the test. This change, or thinning, relates directly to the stability of the grease. The cause of a series of derailments at a company transporting iron ore was established to be grease related. This company developed a list of commercial greases that it considered testing to identify a product that would be more stable and prevent further problems. SKF helped select nine greases for field trials from the original list. 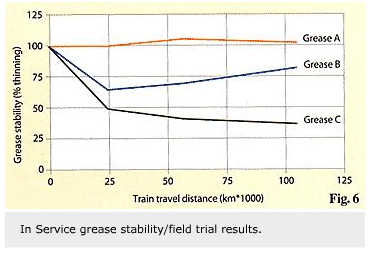 Using SKF experience of the operating conditions, three greases were then selected to represent good, borderline and poor grease stability (designated A, B and C respectively). These greases were tested at different laboratories using the SKF V2F apparatus, the roll stability test ASTM D1831 and in an actual railway application. SKF Engineering & Research Centre (ERC) was one of the participating laboratories. The field trial was conducted on the railway of an iron ore transportation company. 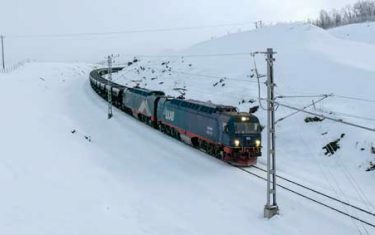 Technical assistance was provided by two other rail companies, SKF and a university. The roll stability apparatus (fig. 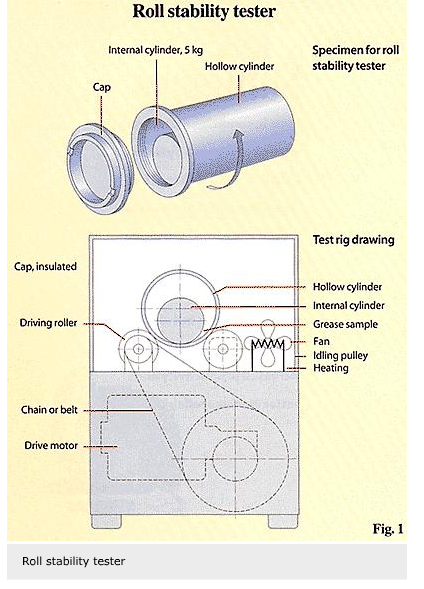 1) consists of a sealed cylindrical chamber in which a grease sample is inserted with a weighted roller. The apparatus is similar to a jeweller’s stone polishing equipment. This assembly is rotated in an oven for a set time, after which the grease is removed and its penetration is measured. Larger penetration change numbers show greater grease thinning and, therefore, less stability. The results in figure 2 show data using four different test conditions developed by two different laboratories. Data are presented for rolling times of 24 hours and 50 hours at test temperatures of 60 and 80 °C. The effect of time and temperature on the roll stability of these greases was then assessed. The averaged results for each test is shown. These have been further averaged for the grease “rows” and for the test condition “columns”. The fact that the results are almost identical at 50 hours for both test temperatures (results at the bottom of columns 1 and 3 of fig. 2) indicates that changing the test temperature does not affect grease stability. The effect of increasing the rolling time from 24 to 50 hours (results at the bottom of columns 1 and 2, and those from columns 3 and 4, fig. 2) shows increased grease instability with increased test time at both test temperatures. The small change (10-15 units) indicates that increasing the test duration increases the severity. The most stable grease, A, should have changed penetration least (lower numbers) while the least stable grease, C, should have changed considerably (higher numbers). This can be seen more easily by looking at the average column where the figures are meant to increase from grease A to grease C. The unstable grease, C, has produced worse results than the other two products while grease B appears to have performed best. Though it has shown that the unstable grease performs the worst, use of this test for grease stability information should be done only with extreme caution. These results suggest that the roll stability test may only be useful as a first screening tool. 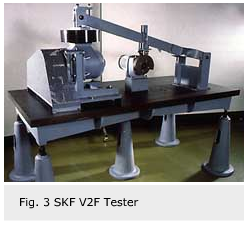 The SKF V2F test apparatus (fig. 3) and procedure were originally designed to emulate stability problems seen in railroad axleboxes. The apparatus consists of a motor driving a railroad axlebox pounded by a hammer once a second. This pounding action gives an acceleration that induces instability in the grease filled into this axlebox. This sounds just like being on a train. laboratories are shown in figure 4. The observed penetration changes of the greases correlate only approximately with grease leakage. This is clearly illustrated in figure 5 where individual data points have been plotted. The graph shows that the grease loss mechanism is grease softening due to vibration (instability), the grease then flowing out of the axlebox. Deviations from the line on the graph show either test errors or other mechanisms in operation. These other leakage mechanisms could indicate procedural problems with the test rig. If alternative mechanisms exist, then why do so few grease/rig test combinations see such alternative mechanisms? 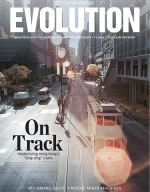 If these features were investigated, then improved test precision might be achieved. Work not reported here has shown that two factors are predominantly responsible for the precision differences. Several tests carried out in unusual ambient temperatures gave points on the graph furthest from the line. 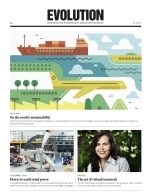 This suggests that an improvement in consistency of the SKF V2F procedure may be achieved if the temperature environment of the rig were specified in the procedure. It was found previously that the degree of vibration and its characteristic vibration spectrum are also critical factors. Work has already been carried out to assess and reduce vibrational differences between test rigs. It was not confirmed that these calibration procedures were carried out prior to running this inter-laboratory test programme. It is interesting to look not only at the SKF ratings for the five test results on each grease but also the total grease leakage and the penetration changes that have occurred. The total leakage range and the average leakage for the greases A, B and C correlate exactly with the expected results. The same conclusions can be drawn from the penetration changes. The averaged figures appear better at predicting the greases’ leaking tendency than the individual data points. This indicates that there is an opportunity to improve the test, perhaps by specifying the temperature of the room where the test is carried out. In summary, these results show that a stable grease passes and an unstable grease fails the V2F test. The borderline grease showed two passes and three failures, according to the SKF designation. Averaged data clearly show the borderline grease to be worse than the good performance products and better than the poor product. It can be concluded, therefore, that the V2F test can clearly discriminate stable greases. Field trials have been carried out in railway wagons transporting iron ore in a particularly demanding location. The trials involved samples of grease removed from the wagons after the train had covered various distances. The percentage loss of the shear strength (relative to grease thinning) has been plotted against distance and this is shown in figure 6. Grease A has changed little during the operation of the train whereas greases B and C both have reduced consistency. It is clear that the SKF V2F test correlates directly with the in-service results. The roll stability test does not directly correlate with either the field trial or the SKF V2F test, but could be used to discriminate very poor performance. The field trial confirmed the ranking of the SKF experience. ERC collated the results of the laboratory test programme and the university involved generated the field trial data with assistance from a grease supplier. The data presented have been selected to demonstrate correlation between laboratory test and field trial results on the same grease. Each grease sample was taken from individual grease drums and used for both the laboratory tests and the field trials to eliminate possible grease batch variation. The data presented here have been taken from two SKF reports. The V2F rig has demonstrated a clear correlation of three test greases selected from the nine products that have been performance tested in a field application. The borderline results have shown intermediate performance dependent upon the test laboratory used. This indicates that test methodology should be further developed to increase the measurement precision for borderline performance greases. It is believed that better discrimination could be achieved through repeat testing, increased test duration, improved calibration procedures and using temperature control of the rig and/or its environment. Multiple testing of greases or increased test duration, while increasing discrimination would probably prove prohibitive in cost and time. If increased precision is needed, then SKF needs to consider eliminating differences between laboratories such as temperature. It would also appear that better calibration of equipment could affect test precision. Some of these conclusions have been established in studies not discussed here. It must be pointed out that the V2F test has demonstrated a good correlation with the field trial results and increasing the precision is possible but may not be considered necessary. Confirmation of the ability of the SKF V2F test to distinguish grease performance has led the group to seek establishing it as a European test method. 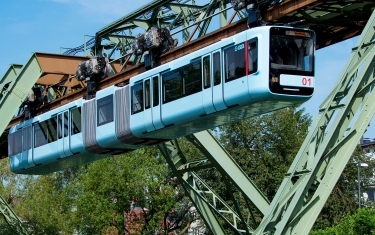 The apparatus is available for sale to other companies, via Quality Technology Centre (QTC) at Steyr in Austria, and has already been used by two national railway companies for the selection and quality control of greases.